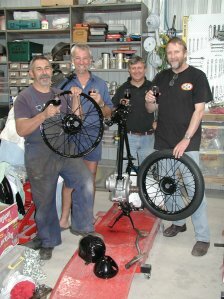 Apart from restoring Bantams, the shed crew play with other bikes as well. 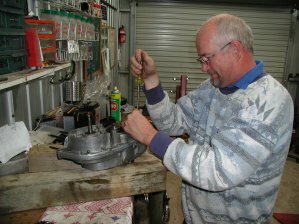 At the moment there are two C11's nearing completion, one C11 being run in, two C11's on the road, a CZ coming apart and, of course, a Bantam coming back to life. The C11's have been great fun and there is talk of a C10 as the next project! 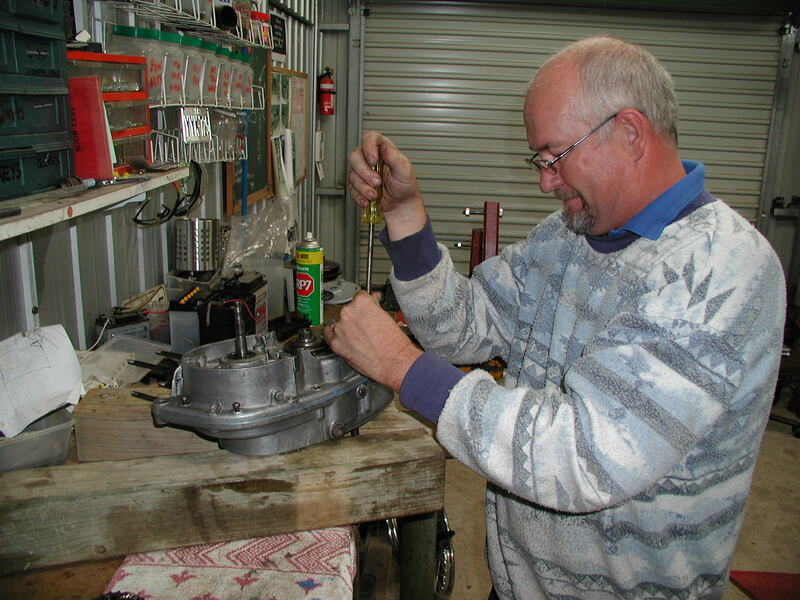 Jim's 1949 C11 is finished! New valve guides, piston, rings and re-bore. Report and more pics to follow. 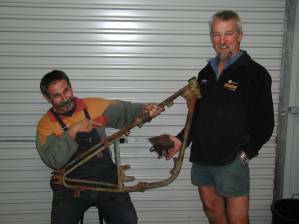 Michael has found two CZ twin port two strokes from about 1951. Here the guys are pictured during the disassembly process. The bike has proved to be remarkably well engineered (despite showing signs of serious mechanical abuse!) 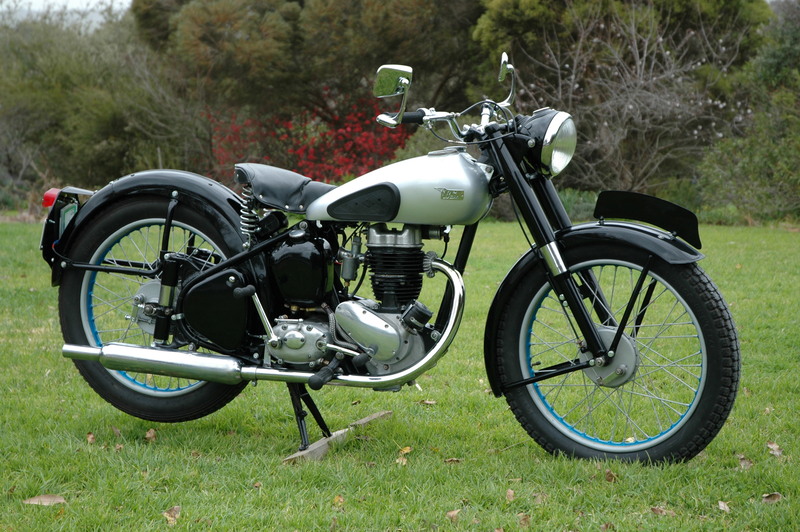 and is quite a contrast to the austere standards of finish on Bantams. 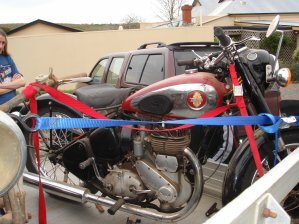 The CZ will prove to be an interesting restoration project. The bike is now in pieces and the frame and other parts are being sandblasted. Michael hasn't even finished the CZ and he has found the lure of the C11 too much to resist! Yes, he's bought himself a C11. An unfinished project, the work so far has been done to a high quality so it was a good purchase. Expect to see more here. Not to be left behind I finally succumbed to the C11 disease. 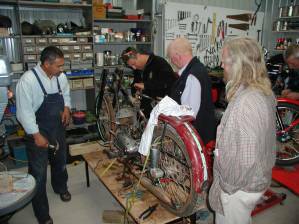 We now have four running C11's in the group and one undergoing restoration. I bought a basket case plunger frame c11 with a four speed gearbox. 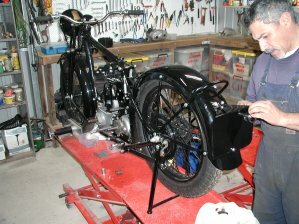 I finished the restoration in August 2005. 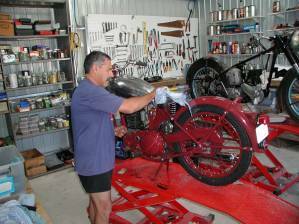 Mick's 1950 Bantam is on the way! A new frame (pictured) and a replacement for the barrel that was already +60 thou. The engine has come apart and looks grim. New conrod needed. The replacement frame is straight but needs work. PS: That's Mick on the right - happy to have joined the Bantam fold! The tale of one man, a heap of Bantam parts and an endless supply of Scarpantoni Shiraz! 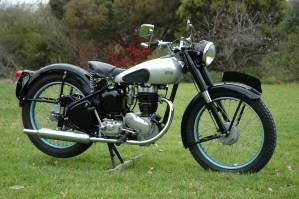 The true life story of how a bike spends 20 years in a seaside cave working as a winch pulling a fisherman's boat out of the water and is rescued to emerge from the shed as a "civilianized" 1942 WM20.